Laxative-3 Blend™ / 60 tabs - Nature's Way®. Take 2 tablets at bedtime. Reduce dosage if you experience abdominal discomfort or diarrhea. If discomfort persists, discontinue use. Do not take more than 2 tablets in a 24-hour period or use the maximum dosage for more than 7 days. Not for long term use. Why is magnesium hydroxide in the Laxative-3 Blend? Is it effective? Will I need to be concerned about cramping and urgency with the laxative? Not likely. 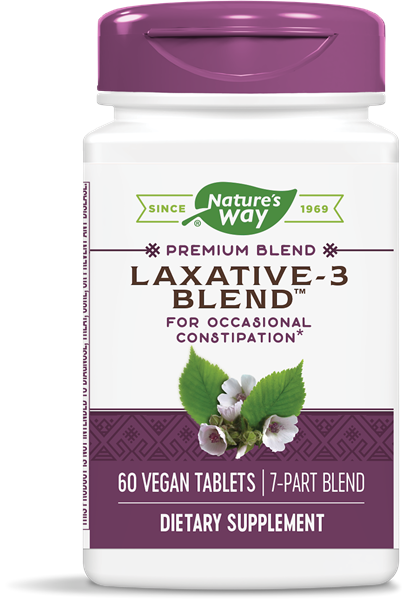 Laxative-3 Blend gently but effectively cleanses the intestinal surfaces and promotes bowel function without the use of harsh, stimulant laxatives, such as senna and cascara.† The safety of magnesium hydroxide has been well established. It does not cause cramping or urgency, nor does it cause dependency. Do not use this product if pregnant, nursing, attempting to become pregnant, or under the age of 12. Do not exceed recommended dose, or take longer than the recommended period, as frequent or prolonged use may result in dependence. Do not use when abdominal pain, nausea or vomiting are present. Consult your healthcare professional if you notice a sudden change in bowel habits that persist over two weeks. Rectal bleeding or failure to move bowels after use may indicate a serious condition. Discontinue use and consult your healthcare professional. This product contains Slippery Elm. Slippery Elm should not be taken together with any medication as it may interfere with their absorption. If you have diabetes, consult your healthcare professional before use.